Welcome to Living Waters Fellowship where God’s healing waters flow. Living Waters Fellowship is a spiritual oasis in the middle of both a physical and spiritual desert providing God’s healing waters to all who come. Our desire is to make a difference in our community for Christ and to meet life’s difficult challenges with real-life solutions. What Type Of Church Is Living Waters Fellowship? Living Waters fellowship falls into the spectrum of a classic Christian church. We believe there is only one true God; that God exists in the form of a Trinity; that God is omnipresent and omniscient; and that God is sovereign and holy. In addition, we believe that Jesus is the Son of God but became a man and was sent to earth to save mankind from death and sin. We believe that he rose on the third day and is seated at the right hand of the Father today. that lives need to be transformed through a “born-again” experience and a life-long process of following Jesus. Have high regard for and obedience to the Bible as the ultimate authority. In the expression and demonstration of the gospel in missionary and social reform efforts. Focus on the sacrifice of Jesus Christ on the cross as making possible the redemption of humanity. Living Waters Fellowship is part of the Foursquare family of churches. The Foursquare Church was founded by Aimee Semple McPherson who was instrumental in bringing about the Spirit-Filled lifestyle. It is one of the leading Pentecostal church movements today. Living Waters Fellowship takes the best from its Pentecostal roots and incorporates the best from Charismatic churches. We use contemporary worship music in our services. We pray for people who need prayer, and we present the scriptures in an informative Bible teaching. 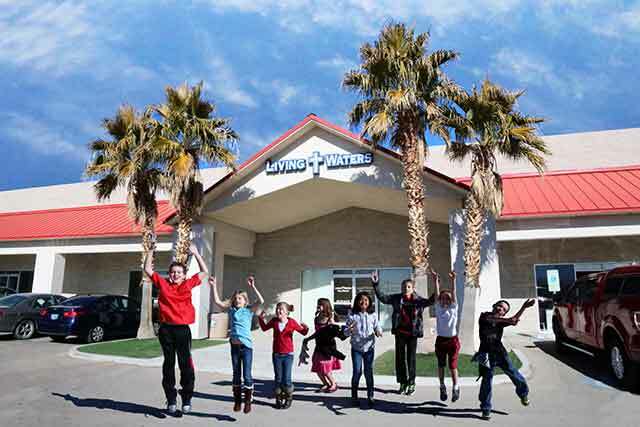 Living Waters Fellowship is a great church for you to consider in Mesquite Nevada. We are near you since we are located behind Ace Hardware. We hope to see you soon! Our Mission is to help hurting people heal and our obligation extends beyond Sunday to throughout the week to impact our community for Christ. We unashamedly teach the Bible and are committed to being a part of the solution by providing real answers to life’s difficult questions. We unapologetically proclaim the Gospel message that Jesus Christ is the way, the truth, and the life, and that no one can come to the Father except by faith in Him. We unreservedly worship the Lord God of the Bible: Father, Son, and Holy Spirit. Welcome to Living Waters Fellowship where God's healing waters flow.